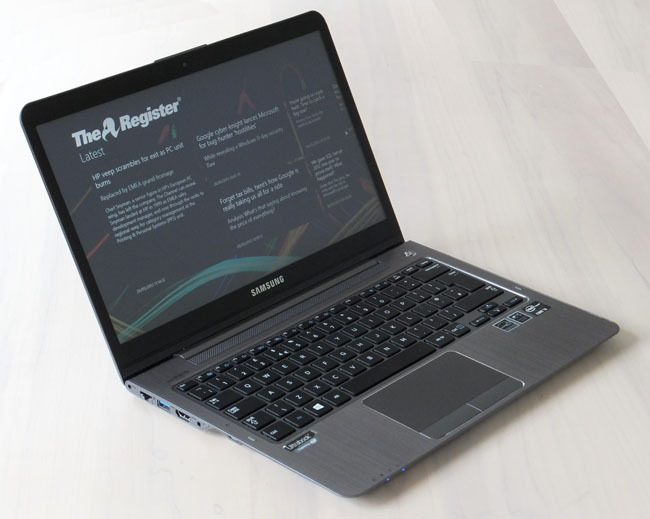 When it comes to handing out Windows 8 laptops to the UK reviewers, Samsung has been surprisingly glacial. Whether this is another Apple emulation strategy to become more elusive or a sign of hesitancy to have the brand tarnished by Windows 8’s underwhelming reception, is unclear. The hardware was paraded at CES 2013 five months ago, so is this laptop latency thing working for the South Koreans, I wonder? Well, here at last is a Series 5 Ultra Touch 13.3in Ultrabook. Let’s see if Samsung has anything to be shy about. I’ll admit that the Samsung UK website did lead me expect a Intel Core i5-3317U-powered model so that I could “make the most of 128GB HDD” [sic]. However, a 1.8GHz Intel Core i3-317U model appeared, luckily with a roomy Seagate Momentus 500GB HDD. This is coupled with a SanDisk i100 24GB SSD to enable ExpressCache fast booting. While this is no substitute for kitting out an Ultrabook with a full-blown SSD, it works out as quite a good compromise. A cold boot takes about 18 seconds to reach the login screen; having 6GB of DDR3 RAM helps, too. You don’t see a mention of this lower-powered machine on the Samsung UK site but it is out there with John Lewis and PC World flogging it for just under £600. That seems pricey to me. And if you want a touchscreen, add about £70 to the total cost. And Windows 8 without a touchscreen is awkward. I must admit, when I took it out of the box, the Series 5 Ultra Touch was heavier than I expected. At 1.69kg it’s between 150g and 200g heavier than rival 13in Ultrabooks, a difference that's immediately obvious. It measures up at 315mm x 219mm x 15mm, swelling another 2.6mm at its thickest, so it's not exactly slim by Ultrabook standards. The shell features an aluminium lid as does the cool touch palm rest area, with the underside resorting to glass fibre. The glass fronted display covers the screen margins extending right up to the edge of the lid. It all looks pretty good actually and certainly gives the impression that you’re touting a hardy Ultrabook. Samsung gets Brownie points for including a gigabit Ethernet port which many Ultrabook makers presume is no longer relevant. We may have to blame Apple and its MacBook Air for encouraging manufacturers of larger form factors to ditch the socket and go Wi-Fi-only. But Samsung has shrunk the monitor output to deliver a VGA port via a micro HDMI interface. There’s not a single word on the part number of the accessory cable required for this port in the manual although the website has it listed, albeit permanently out of stock. Luckily, the Ultra Touch has a full-size HDMI port that should suffice for most these days and it does, at least, provide a route to full HD from the integrated Intel HD 4000 GPU, although some higher-spec models feature a GeForce GT 620M. Alas, the 13.3in screen's resolution is only 1366 x 768 pixels. And if our readers' comments are anything to go by, many of you hankering for full HD displays will stop reading at this point.